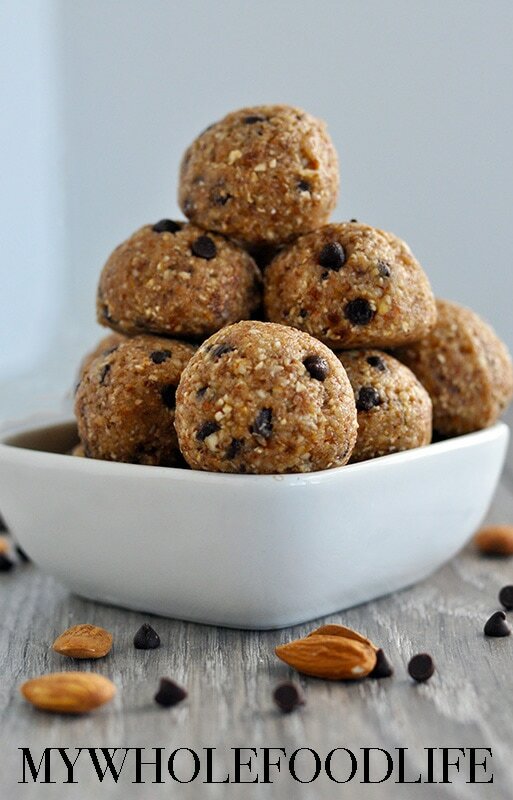 Healthy No Bake Cookie Dough Bites. Yes, you read that title right. 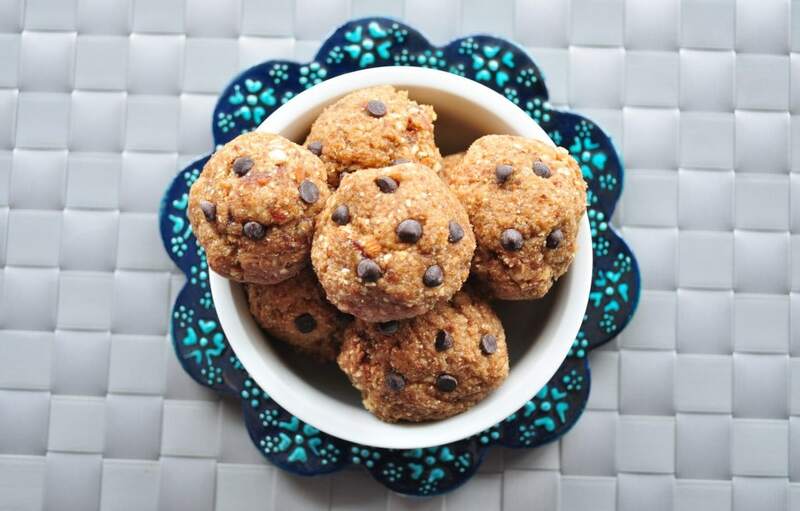 Healthy no bake cookie dough bites. Such a thing does exist! Who doesn’t love cookie dough? 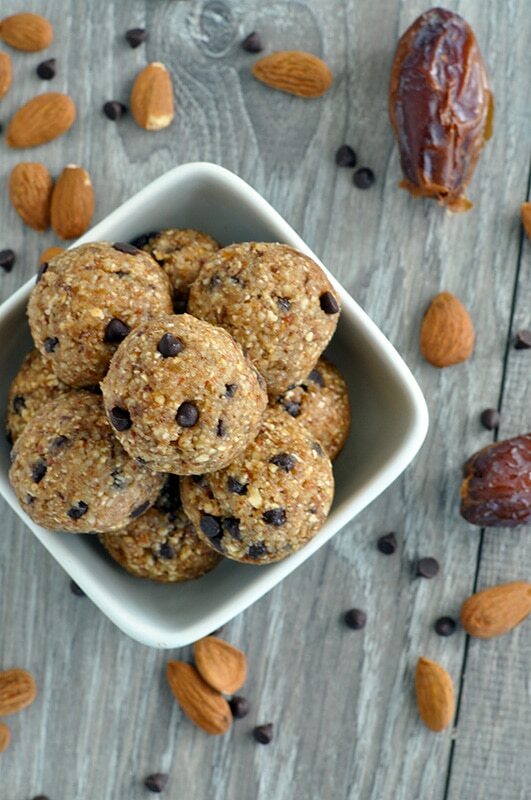 These are sinfully good even with no refined sugar. These no bake cookie dough bites may just be the most delicious things I have ever made. It gets even better. They only take minutes to make. You could just be minutes away from popping one of these babies in your mouth. I am drooling just looking at the picture. These would go great with a glass of my Homemade Almond Milk. We filmed a short video for this recipe. For more videos, you can subscribe to my You Tube Channel. Looking for more no bake bite recipes? optional chips, coconut, cacao nibs, raisins, etc. Throw the almonds and oats in the food processor and blend into a fine powder. Then add dates and continue to blend. Lastly, add the water, a little at a time until a paste like dough forms. Roll dough into little balls and place on a lined baking sheet. Put into the fridge to get the dough to firm up a bit. Eat and enjoy! Oh yum! Love those additions! Do you have any ideas on how to make these grain free? You can try using almond flour in place of the oats. Do you have to use raw almonds? Could i use roasted almonds? These were great! I added a fat pinch of pink salt and it made them taste even more like chocolate chip cookie dough. Thanks for the recipe!